What. A. Find. A pretty, whitewashed pub in a historic town on the Somerset/Devon border, with a cabinet groaning under the weight of awards. You know those pretty unassuming-looking pubs, the types that just look like a cosy part of the furniture? The ones that haven’t given completely over to the uniformed look of gastro-pubbiness (it’s in my dictionary, which one are you looking at?! ), that the locals pitch up at, daily, and that make you feel slightly jealous that you don’t have one fifty yards down your own road? That’ll be the Swan, the oldest pub in town. 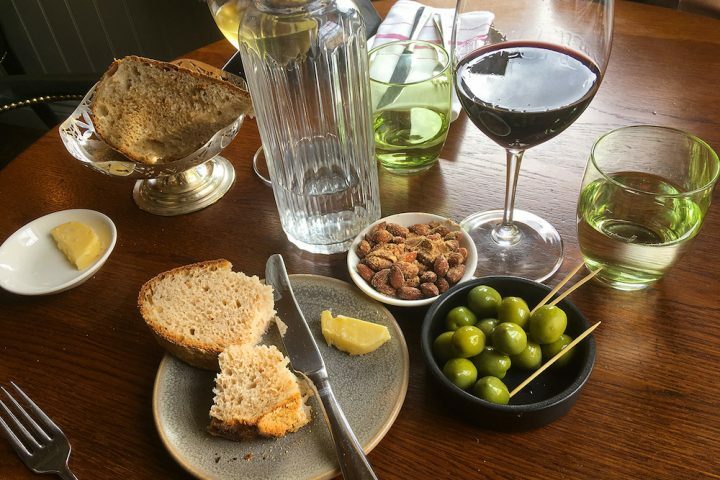 Bampton, teetering on the Devon/Somerset border, is perfectly placed to nip off the main roads and stop for a bite (or a night), whether you’re headed north, west, east, anywhere really. Me and the Muddy clan broke the journey to North Devon one Friday afternoon and timed it just right for an early doors lunch. 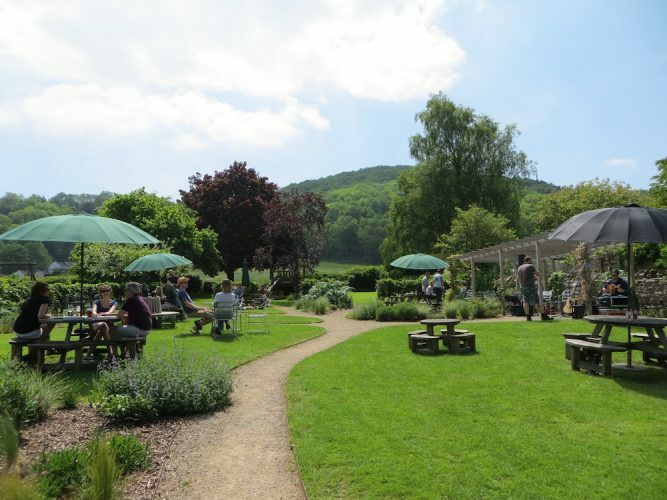 It’s a historic market town, on the fringes of Exmoor National Park and roughly equidistant from the north and south coast of the county (40-ish minutes), full of listed buildings and a winner of Britain in Bloom several times; you get the picture. Back in the spring this pub, with restaurant and rooms found its way on to my radar, since it had been getting a lot of press and deservedly so. 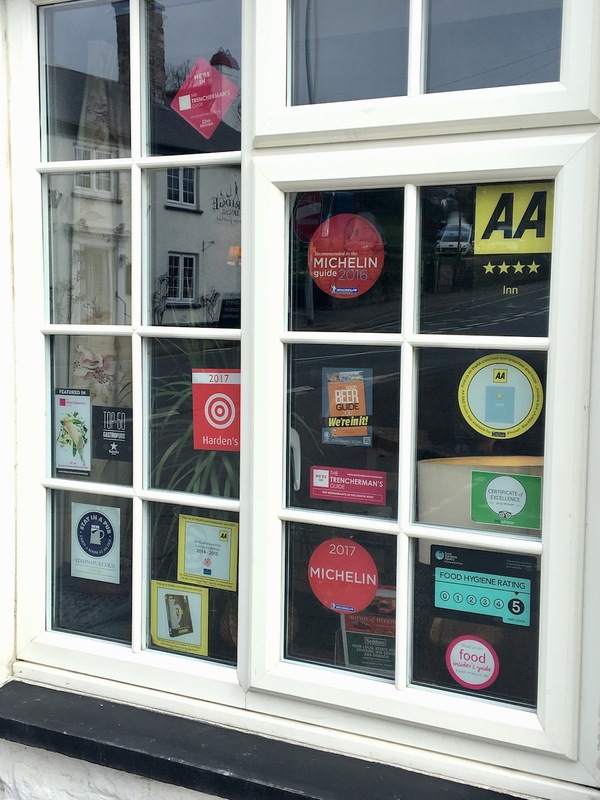 The breadth and variety of awards won over the past 18 months is impressive, from Visit England, to Trenchermans, The AA and, in January this year, finding its way into the Estrella Damm Top 50 Gastropub Awards list. Plus, most importantly of all, a finalist in the Muddy Awards. The judges, you included, say the Swan does all three of its ‘Eat, Sleep, Drink’ offerings in a top notch kind of way. Not that the awards have given the Swan any hint of pretentiousness. 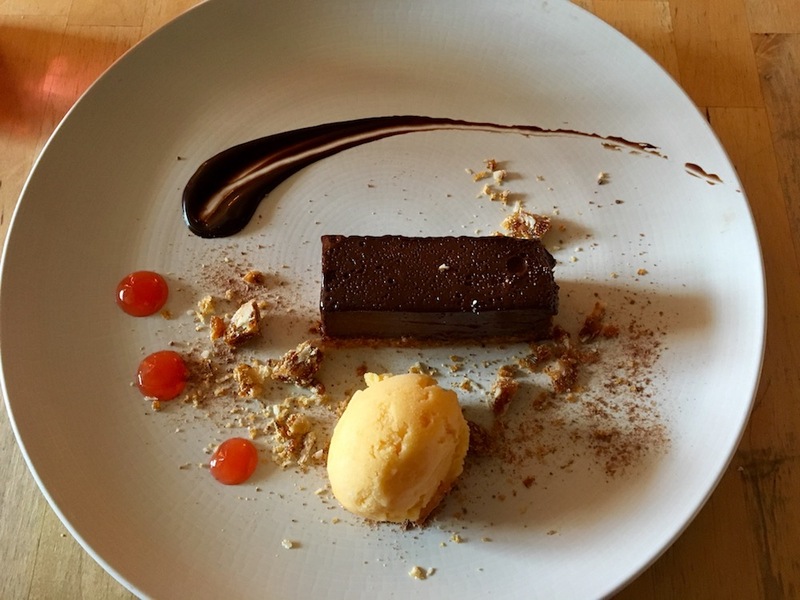 The offering is warm, relaxed and everything you’d expect of a local boozer, with added excellence in all the right places, namely on a plate or in a glass. 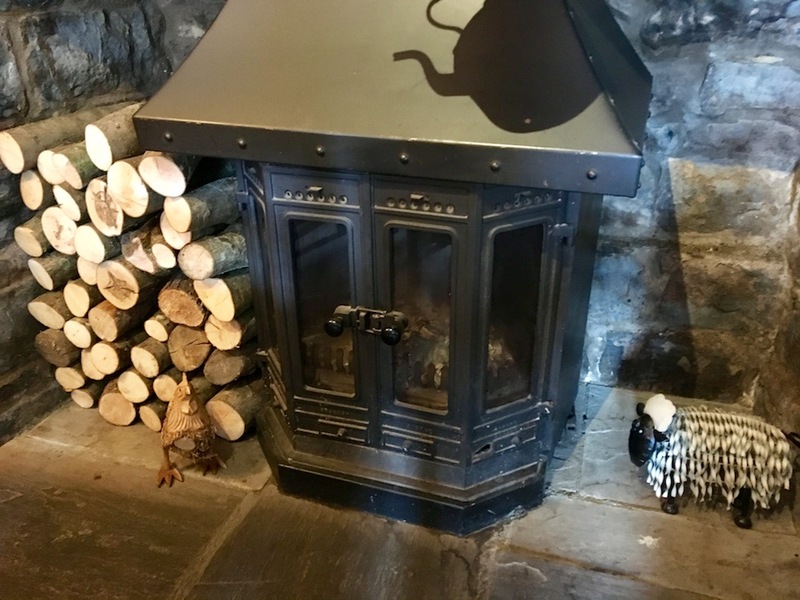 Inside, you’ll find a smart oak bar against a more traditional backdrop of flagstone floors, original fireplace and bread oven, dating back to 1450. See, oldest pub in town! So, did I mention that Bampton is in an area known for its shooting, fishing and hunting? It’s a tasty part of the world and that’s definitely reflected in the menu. We came for lunch, so ordered a couple of pub classics. Mr Muddy had a steak and red onion marmalade toastie and promptly fell into a state of silent contentment after one nibble. I mean, we’re talking a simple dish done stupendously well. I, being a piggy plumped for fish and chips, being a Friday after all. 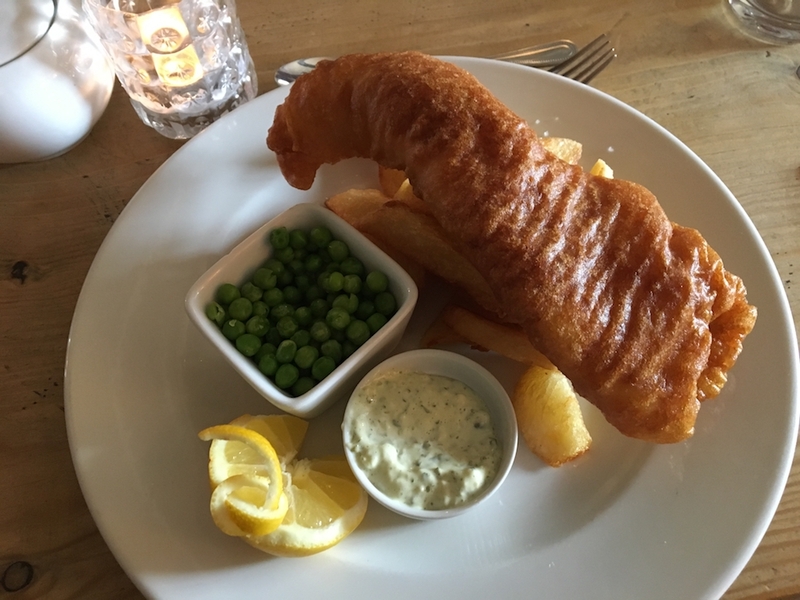 Beer battered, melt-in-the-mouth Brixham haddock served up in a coma-inducing portion. I more than dented it and, you’d think I couldn’t make room for anything else, but what kind of Muddy would that make me? 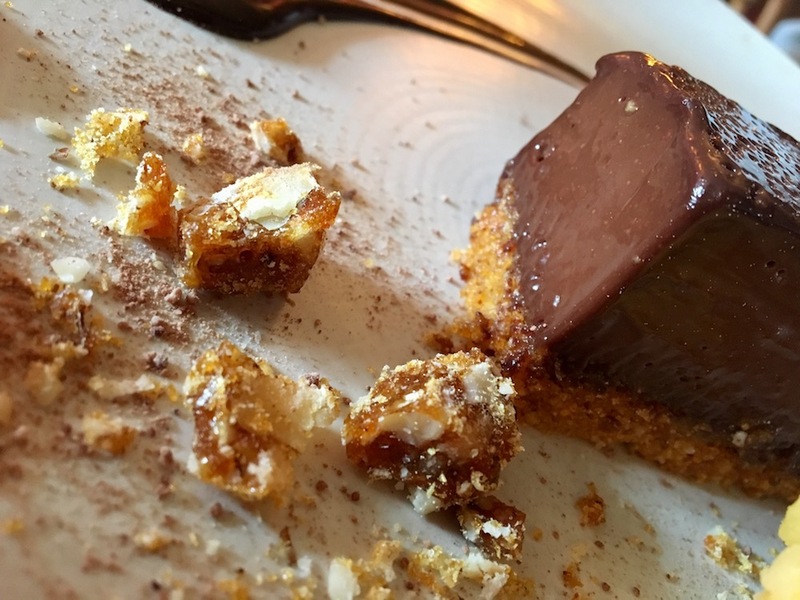 Between courses, landlord Paul arrived and pulled up a pew to chat and he wasn’t keen to see us go without having tried a sneaky taster of a brand new dessert, making it’s debut on that nights’ menu: chocolate delice with a hazelnut praline. One pud, 3 spoons = gone in approximately 30 seconds. This was a glimpse at what dining off the main menu is like. 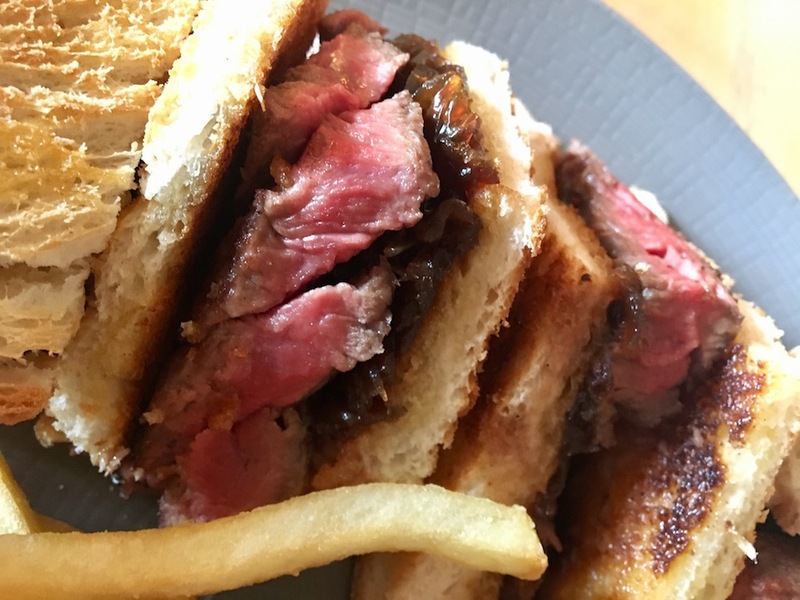 You’ll still find pub classics like pies, steaks and sausage and mash, but inventively prepared. The small plates menu looked particularly interesting, with Exmoor ox cheek lasagne and Salcombe Crab up for grabs. Paul is clearly a man who loves sourcing local and encourages nudging of the boundaries when it comes to his menu’s. I’d say the result is reassuring and exciting at once and that’s only part of the reason why this place is consistently full. Worth also knowing that there’s a damn good selection of real ales and local drinks to wash it all down with. The ‘pub’ bit is certainly not the poorer half. Yep…in fact, anything-friendly (within law-abiding reason, I should think). But the sign above the door pretty much says it all. Even those with stretchy pants are welcome! The Mudlet was thoroughly spoilt by the super-friendly bar team and landlord, Paul. 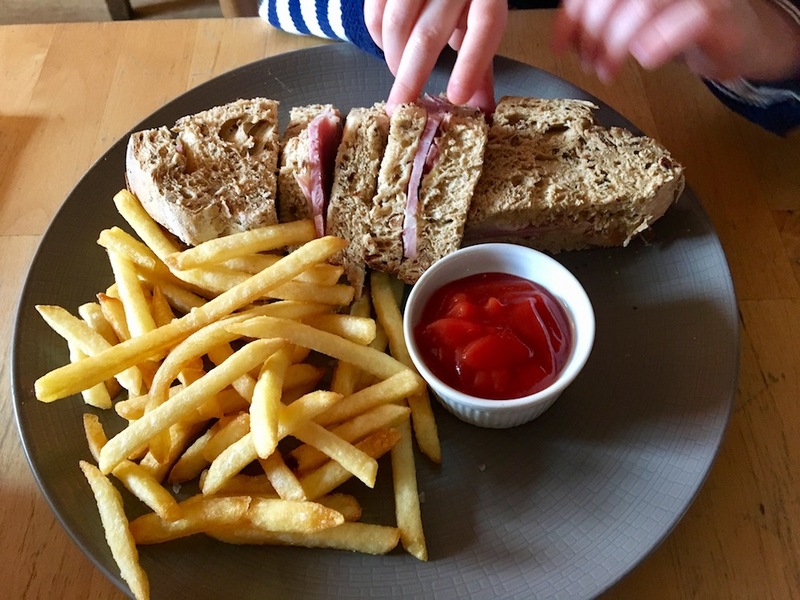 When she could tear herself away from her hunk of ham sarnie & chips, that is. You try taking a pic of a toddler’s lunch before she gets her paws on it! If you’re incoming for the holidays, Bampton is a pretty good introduction and, if you’re from these parts, chances are you’ve either not discovered this place, or you’ll be glad to make the detour. 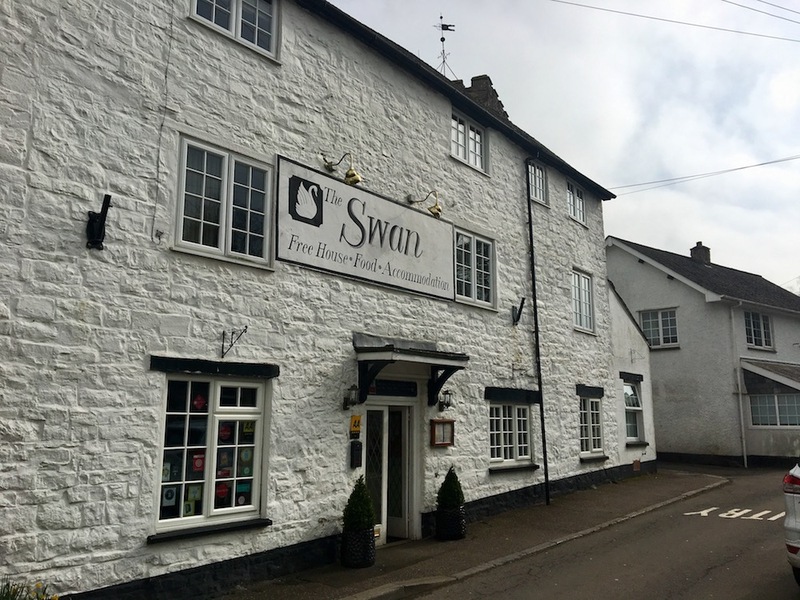 The Swan has cosy, country-styled rooms upstairs and, if you do stay then you’re well placed to get out and explore Exmoor like the zillions of other ramblers and riders who look forward to a pit-stop at this destination pub. 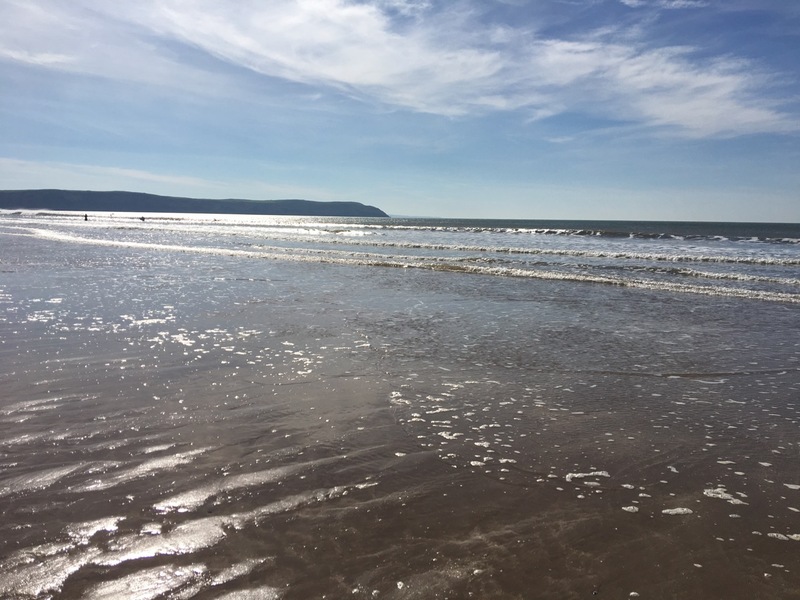 For us, it was onwards north, to Combe Martin and Ilfracombe and so glorious beaches like these are less than an hour away. 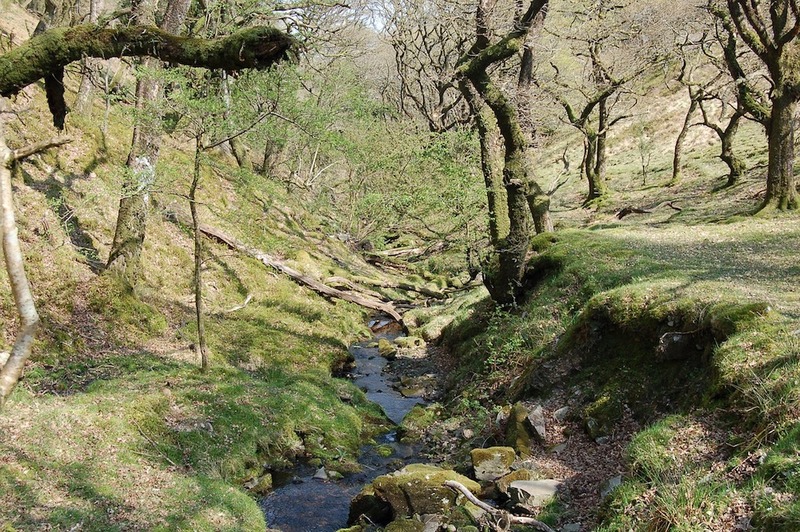 Good For: walkers, travellers looking for a stop-off that isn’t a service station (not a KFC for miles! 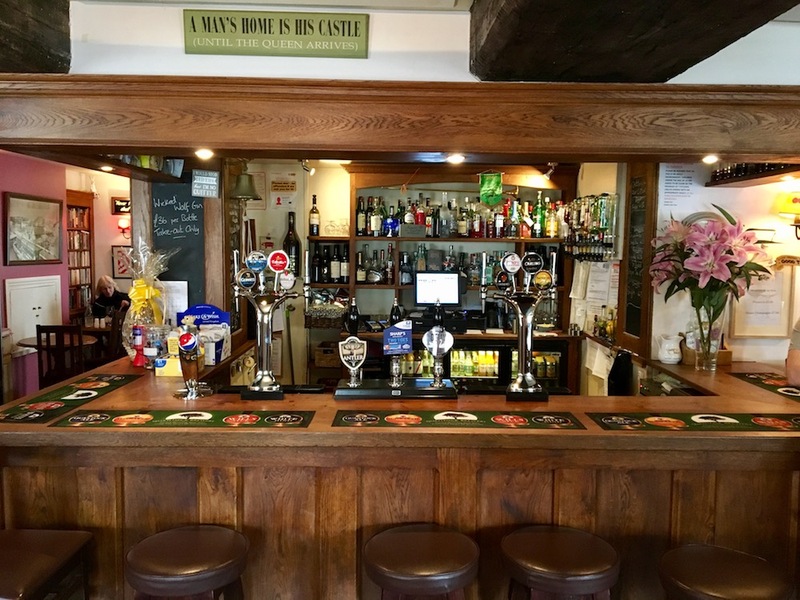 ), families and four-legged friends, looking for excellent, hearty food and drink with a traditional, cosy pub atmosphere. 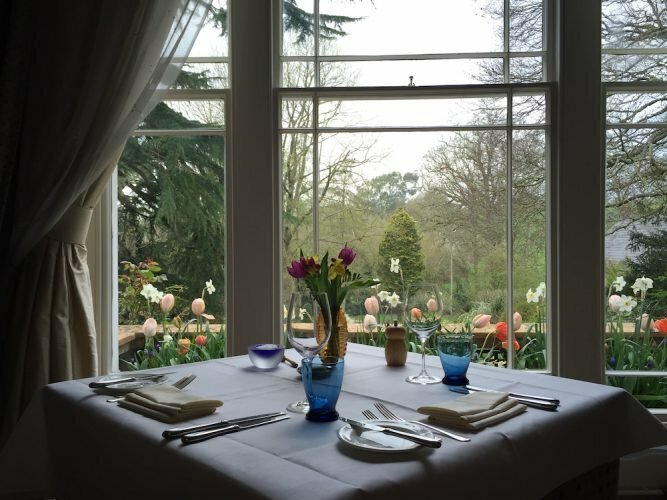 Worth also knowing that you can book for a private dining experience for up to 20 covers. Not for: those looking for a trendy place to get dressed up for and sip cocktails at the bar. It’s a pub, through and through, which happens to have a stonkingly good menu. The damage: very reasonable. Small plates £4.95 – £7.95, mains £12.95 – £22.95 (for steak, the most expensive thing on the menu), puds £6.50.